For every backyard astronomer, we know 4.5 billion years ago, both Venus and Earth were formed with nearly the same radius, mass, density and chemical composition. Venus is like Earth’s evil twin, but why is the climate on both worlds so widely varied? Scientists analysing the data from the orbiting European Venus Express spacecraft are finally putting the pieces of the geological and climatological puzzle together as they take a closer look at Venusian evolution. Today, Professor Fred Taylor of Oxford University presented the scenario in a talk at the Royal Astronomical Society National Astronomy Meeting in Belfast. According to the studies, Venus appeared to have evolved very rapidly compared to the Earth during the early formation of the solar system. Thanks to data obtained from the Venus Express, it would appear our wicked sister planet once had significant volume of water covering the surface… Oceans which were lost in a very short geological timescale. As the water disappeared, the geological evolution of the surface of Venus slowed quickly – unable to develop plate tectonics like the Earth. Biological evolution could never happen. If, at one time, Venus mirrored Earth in climate and habitability terms, then it evolved too quickly at first, then too slowly. Here on Earth, carbon dioxide is captive plant life, minerals and the crust itself. Not to harp on global warming, but the release CO2 back into the atmosphere is a source of climatic change. On Venus, the majority of the carbon dioxide resides it its atmosphere, leaving the surface temperature at a searing 450 degrees Celsius. This slows or stops geological as well as biological evolution. But, we haven’t heard the last from Venus Express just yet. Due to operate until May 2009, scientists involved in the project are already busy applying for an extension until 2011. It is 4.5 BILLION years and NOT millions. The Earth is muuuuch older than just millions. Still Humans act like children nonetheless. thanks for the heads up. error corrected! No problem mate…keep the good stuff comming please. Very insightfull article by the way…Props to you and thanks for keeping it real. Any ideas about the mechanism that eliminated the water from the surface of Venus? Or the percentage of Venus that may have been covered in oceans? Also, when referring to “rapid” and “slow” evolution of Venus, approximately when would be the switchover date? 3.5 gya? 4 gya? One theory that I have had would seem to explain much of the Venus situation yet I never hear it or read it. Impact. The temperature of Venus, even given the greenhouse gasses, is hotter than it should be. The surface of Venus appears as if it was globally resurfaced recently, few craters and little variability to indicate “old” vs. “new” surface. and Venus rotates backward. Put together how about an impact event much like the impact that hit the Earth and created the moon, only at an angle that did not create a moon, and recent such that the planet has yet to recover from it. If Venus was nearly Earthlike in the relatively recent past (like a billion or half-billion years) but was hit by a huge impact, enough to melt the whole surface, and release billions of tons of CO2, that might explain the conditions we see today? A recent paper on Earth and Planetary Science Letters puts forward another explanation: Venus as the result of a massive crash between two large protoplanets. In other words, no water from the onset. Hence, a completely different tectonic evolution. The paper suggests a way to disprove the idea: find lithological evidence of the presence of water on the surface, no matter how old. While venus is hot enough to even melt lead, is there a way to figure out whether Venus is cooling or warming up? If we can observe very subtle temparature variatons on a global scale over a decade or more, we would know for sure. We can then confirm or rule out if some something dramatic has happened very recently. Would not an impact have created a perturbance in the orbit of Venus such that we could still detect the wobbling? What sort of force would be required to reverse our own revolution? Or more accurately, the revolution of a somewhat smaller body, such that the combined mass would equal that of Venus now. Is there any evidence of ejected material from the impact in the form of meteorite craters from the likely era on the moon or earth? Why would 450 surface degrees halt geologic evolution? Would there be a detectable wobble in the core of Venus if the mantle was forced into a retrograde revolution by an exterior body? That is, if the interior was liquid at the time of impact. Why would water have anything to do with plate tectonics? Is it the oil that keeps plates slipping past each other? The no water from the outset postulate for Venus would also suggest that there were few, if any, cometary impacts on Venus: but then, why comets hitting Earth and not Venus? The new abstract that you quote concerns a present day event. It is likely that in the early history of the solar system, cometary impacts with the inner planets were far more common than today. While comets may not be the sole source of water for planets like Earth and Venus, they were likely significant contributors, hence accounting for “the significant volume of water”. Jose reference to a paper from Earth and Planetary Science Letters suggests “…In other words, no water from the onset….” while it may suggest that there was no ‘original’ Venusian water (though I’m not sure why a similar result would not obtain for Earth if the Earth-Moon system was created by an impact) it would seem to conflict with the possibility of a cometary source of water on Venus. It would be interesting if Jose could give us more details re that reference. First of all Venus is hotter than earth because its closer to the sun and because ithas the green house effect which is why theres always clouds on the planet. Venus by the way is not in a special part of the solar system like earth. Earth is in the ecosphere of the solar system where it is neither too hot or too cold but just right. Mars is too cold Venus is too hot but the Earth is just in the middle hence the ecosphere. What makes sense to me is the article that I read that early in the solar system early history is that Venus was struck neary head on and that accounted for it’s slow rotation. That, combined with its close proximity to the Sun gave Venus prolonged periods of warming on one side of the planet and did not allow for that body to cool because it does not have a rapid rotation. 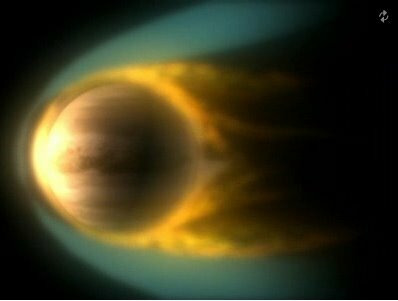 Venus does not have a strong magnetic field. It has a slow rotation. These forces inhibit the presence of water because of Venus’ close proximity to the Sun. Water is the force that drives plate tectonics. It is the second most factor of determining the temperature of a planet. (Solar radiation first, water second). I think all you Global Warming advocates could come up with a way that we could go to Venus and start up “Climate Change” there so we could colonize and eventually destroy that planet too. If Venus lets say were to be relocated into the orbit of Mars, would it have an earth like temperature and climate or would it still be hotter than Earth? Now if Mars were to be relocated into the orbit of Venus would similar outcomes also occur or would Mars permanently lose its atmosphere from the current Venusian distance to the Sun?